With potential in its iron, copper and fishing industries, the West African nation of Mauritania could see economic improvements in the coming years. However, the country remains crippled by a multidimensional crisis caused by food insecurity, a high rate of malnutrition, limited access to water, institutional barriers to educational opportunities and an existing system of slavery. Here are 10 facts about living conditions in Mauritania. Malnutrition. In Mauritania, climate-related effects on crops, such as droughts and inconsistent rains, have caused food shortages. Over 130,000 children, including nearly 32,000 children with severe acute malnutrition (SAM), and 31,000 pregnant and lactating women, will require nutritional care and treatment in 2019. Energy. In Mauritania, only 29 percent of the nation has access to electricity. However, the Mauritanian government has made it a priority to expand its electricity supply in a bid to reduce poverty. Efforts to increase access include encouraging investment into the renewable energy sector in order to stimulate the economy. Education. Children aged 6 to 14 are required to attend school in Mauritania but systematic barriers have prevented many students from getting the education they deserve. Mauritania’s civil registration process requires families to produce official paperwork for children to be admitted to primary schools, but such policies disproportionately affect low-income families who lack the necessary documents and have found replacing them to be an arduous process. Only 40 percent of children from the poorest households are registered compared with 85 percent of children from the wealthiest households. In addition, such social and ethnic barriers are known to discriminate against Mauritania’s Haratine (Hassaniya-speaking former slaves or descendants of slaves) or Afro-Mauritanian populations. Gender Equality. Mauritanian women and girls face many cultural and social battles. Grooming young women to take on the role of a wife and then forcing them to marry before the age of 18 is a common and accepted practice. In addition, freedom of choice remains elusive for girls in Mauritania. Female Genital Mutilation (FGM) is also a commonplace practice with a prevalence rate of 66 percent. However, data from UNICEF shows a change in attitude around FGM leading to tougher legislation. Right to Water. The only available water table is in Trarza (southwestern Mauritania). Leaky pipes in the impoverished areas of the city have contributed to an inadequate distribution system resulting in only 68 percent of the population having access to water. Still, this population is restricted to less than 50 liters per day per person. In rural areas, drinking water shortages are more recurrent. Efforts to increase access to drinking water remain strong in the West African country. With support from technical and financial partners and implementation of the necessary projects and programs, humanitarian groups believe the West African country can meet its goal of supplying water access to 100 percent of the population by the year 2020 with a 2030 deadline. Slavery. Mauritania was the last country to make slavery illegal in 1981, just 38 years ago. Still, thousands of people — mostly from the minority Haratine or Afro-Mauritanian groups — find themselves living as bonded laborers, domestic servants or child brides. It is estimated that up to 20 percent of the population is enslaved, forced to work on farms or in homes with no possibility of freedom, education or pay. Recently, two slave owners were jailed receiving the toughest sentence to date for slave owners at 10 and 20 years. Despite these historic sentences and the fact that Mauritania criminalized slavery in 2015, the Sahel country has jailed more anti-slavery activist than slave owners. The African Union has urged Mauritania to issue harsher sentences for this crime. Access to Health Care. Currently, the country is suffering from a poor health care system resulting in very high maternal mortality and infant mortality rates. In addition, only a small percentage of the population is covered by the national insurance scheme. Divisions in government and political agenda have made it coordination efforts challenging for the donors and NGOs on the ground. Infrastructure. 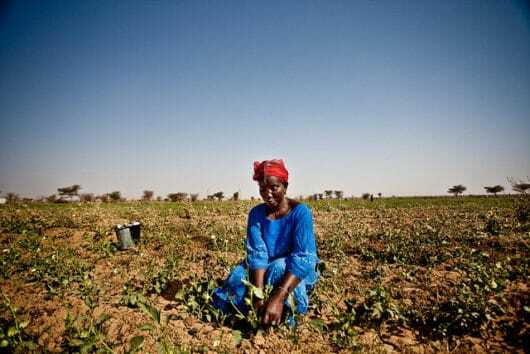 Although Mauritania is 90 percent desert the economy relies heavily on agriculture as a main sector of the economy. However, the major agricultural industries: meat, milk and fish are being held back by a lack of processing facilities. It is hoped that increased investment in areas such as hydrocarbon development will help bolster agriculture in the country. WASH practices. In the capital city of Nouakchott, signs of improvement are palpable. For example, water basins have been installed and classroom instruction on proper handwashing and better hygiene practices have been implemented, benefiting more than 6,500 people. Improved conditions for students also means fewer absences from school. Medical Waste Disposal. Proper medical waste disposal in these regions are creating healthier environments. With the installation of six biomedical waste incinerators, health centers are reducing the health risks that are posed by exposure to infectious microorganisms found in medical waste. Moreover, proper medical waste management and disposal help protect the environment from hazardous substances allowing for soil, water and air to be used for growing food. As these top 10 facts about living conditions in Mauritania show, the country faces an uphill battle as it continues to progress into a self-sustaining country. However, government initiatives along with support from international aid groups continue to tackle social and systematic barriers in order to change the status quo. Mauritania is a deeply divided and struggling country. Slavery has only recently been legally abolished, about 20 percent of the population lives on less than $1.25 a day and over half of adults are illiterate. Although one of the biggest threats to Mauritania remains the increasing influence of Al Qaeda, poverty and lack of female educational opportunities are some of the worst perils facing Mauritanians in their daily lives. To understand the current reality of girls’ education in Mauritania, it is first necessary to know where the country has been. Initially settled by Berbers and Arabs in the 3rd century A.D., Mauritania was a trading and transport hub for connecting West Africa to the Maghreb. In the 1850s, France came to control the territory militarily, leading a brutal regime of oppression. This regime left those living in the area profoundly divided between Arabs and Berbers and subjugated to subhuman conditions. By 1904, France formally established Mauritania as a colony, and in 1920, Mauritania became part of French West Africa and was subsequently administered by Senegal. Mauritania became an overseas territory in 1946; by 1958, the country was self-governing and became independent in 1960. Shortly after Mauritania gained independence, a series of elections, coups and race riots took place through much of the latter 20th century. The elections and coups slowed to a considerably slower pace in the 2000s and the subsequent decade, providing Mauritania with some semblance of stability. This stability was vital; it allowed outside organizations such as the U.N. and UNICEF to offer much-needed assistance to the battered nation of 3.7 million. Between 2000 and 2007, for example, literacy declined nearly 8 points. This was primarily due to the Mauritanian government’s failure to dedicate any time, money or resources to education. While Mauritania has had significant struggles with education, there have been signs of improvement and cases of success. For example, the NGO Global Partnership for Education (GPE) began funding the Mauritania Basic Education Sector Support Project. Over the course of this program, gross enrollment rates increased from 88 percent to 97 percent and completion rates rose from 53 percent to 71 percent between 2001 and 2012. Girls’ education in Mauritania also improved significantly; 21,168 adolescent females have been enrolled in lower secondary education in 2016, as opposed to 7,400 in 2014. UNICEF has also forged a partnership with the Mauritanian government to promote education and provide resources for schools. This national partnership was reached following the success of UNICEF’s initial mission in the country. The new goal of UNICEF and the Mauritanian government is to achieve universal access and completion of secondary education for all Mauritanian children. It is critical to recognize why female education in Mauritania is so important beyond the educational aspects. Girls’ education has been shown to lead to female empowerment. In a country so bitterly divided and struggling with social progress, support for women’s empowerment is a vital aspect. Improving education in Mauritania also improves poverty in the country. The United Nations Girls Education Initiative reports that many young girls in Mauritania face dire poverty. Since only 53 percent of households have access to clean water, disease is common, and there is insufficient access to vaccinations. Girls’ education provides access to schools, which in turn provides access to the water and medicine many desperately need. While the challenges to girls’ education in Mauritania are plentiful and can seem immense, much headway has been made in recent years. With organizations like the U.N., UNICEF, and GPE working with the government, there is significant improvement on the horizon for girls’ education in Mauritania. Mauritania is an impoverished country located on the west coast of Sub-Saharan Africa in the Sahel region. Of its 4.1 million people, 42 percent live below the poverty line. The population faces additional challenges of high youth unemployment rates and low levels of formal education. However, a huge decline in the poverty rate during the 2010s and successful projects in humanitarian aid to Mauritania place the country in a position to grow economically. Mauritania gained independence from France in 1960 but has since seen two coups creating some political instability. The first occurred in 1978 and the second 30 years later in 2008. The second coup coincided with a time of poverty reduction, and the 2000s, in general, brought GDP growth for Mauritania. The mining industry is large in Mauritania and was a big factor in that growth due to an increased global value of minerals. Humanitarian aid to Mauritania can help further boost the growth of the country and benefit the people. Below are four areas in which humanitarian aid has been a success. Finance – The World Bank has been involved with humanitarian aid projects in Mauritania since 1963 and is working on financial projects that benefit the people. There are currently eight projects that total over $370 million in aid to Mauritania. The projects align with the goal of creating jobs, as well as provide analytical work and technical assistance. Also, in 2012 the World Bank’s International Finance Corporation (IFC) invested $12 million in commercial banks to provide a $127 million two-year credit line so that Mauritania would have a stable source of energy products. Education – The World Bank is also involved in two educational projects in Mauritania. Mauritania’s population suffers from a lack of formal education and a 44% youth unemployment rate. These World Bank projects (totaling over $30 million) educate the population and increase the relevance and efficiency of vocational training in Mauritania. The projects are also working with training institutions to modernize them and improve their programs. Seven of these institutions already have performance contracts and three will be internationally certified to best prepare the workforce. Climate – Located in the Sahel region in Africa, Mauritania has a semi-arid climate. Additionally, as a coastal country, Mauritania faces challenges from sea level rise and erosion. Up to 30 meters of coastline is lost in any given year. To combat this, Mauritania is working with other countries, regional alliances and international partners. Mauritania is developing an investment plan based on environmental analysis that will be part of a foundation for its future sustainable development. Also, Britain’s Oxfam is working to help the population affected by recurrent climate crises. Food – A large portion of humanitarian aid to Mauritania focuses on food security and nutrition. The European Commission is working to prevent malnutrition of those most vulnerable in the population. Additionally, USAID is working with Action Contre la Faim (ACF or Action Against Hunger in English) to prevent malnutrition through cooking demonstrations and nutrition education. Further, they conduct screenings to identify children most at risk of malnutrition so they can be treated. They have contributed over $200 million to ensure food availability in Mauritania. Despite the improvements in Mauritania in the 2000s, there are still many people living in poverty and the country faces development challenges. Humanitarian aid to Mauritania has been essential to helping the people of the country and will continue to help grow the economy. Mauritania is a country located in West Africa that gained independence from France in 1960. In 2007, Mauritania saw the election of its first independent and freely elected president. However, his term in office ended abruptly when he was deposed by the military in 2008. General Abdel Aziz was then sworn into the presidency in August 2009 and was again re-elected in 2014. Mauritania continues to experience tensions between ethnic groups, and suffered serious threats to its security through activities from various terrorist organizations. However, since 2011 strategies and development projects in Mauritania have been implemented that use dialogue and military actions, which have stopped terrorist attacks from occurring thus far. After years of insecurity and instability, the situation in Mauritania is improving politically. Various international and national organizations are working in Mauritania to improve the lives of citizens and increase economic growth and decrease food insecurity. Here are five development projects in Mauritania that are currently active or have recently concluded. This project was approved in 2003 and ran until 2012, and was financed by IFAD. Costing a total of $33.9 million, its major objective was to reduce the poverty rate in five provinces in Mauritania. The project promoted sustainable farming solutions through the spread of technology and supported the financing of economic as well as social infrastructures, which reached 50,000 households. This is another project financed by IFAD, but one that is currently active. Costing a total of $28.9 million, this project aims to improve livelihoods and incomes for women and young people in 21,000 rural households in three moughataas (departments), which include M’Bout, Ould-Yengé and Kankossa. This will be achieved by fostering an increase in the economy through sustainable resource management, specifically by developing systems of crop and livestock management, soil restoration and water management and support for local project development. This project is funded by the African Development Bank (ADB), the Nigeria Trust Fund (NTF) and the Mauritanian government, with loans of $11.69 million and a grant of $720,000 from the ADB and a loan of $8.6 million from the NTF. The construction of this road will help develop the right bank of Senegal River and will have an enormous impact in promoting the development of agriculture, fishing industries and transportation services. It will affect 100,000 people in 67 localities. This project, started in 2006, will conclude in 2020 and will affect regions of Gorgol, Guidimakha and Brakna in Mauritania. Implemented by the International Labour Organization, and costing a total of €3.2 million, this project’s primary objective is to help improve the living conditions of youth through improving access to professional training and employment. The goal of the results are to improve the quality of work in construction through training and enlarge the scope of professional training programs. Although only five development projects in Mauritania are mentioned here, there are numerous other organizations working within the country to improve the lives of Mauritanians. Through collaborative and inclusive effort, the livelihoods, economy and food security of many are sure to improve. The World Bank and the Competitiveness Industries and Innovation Program (CIIP) aim to strengthen women’s empowerment in Mauritania through the country’s leading industry: fishing. Women constitute 30 percent of the workforce within the fishing sector, and therefore participate in the growth of the country’s economy, as the industry contributes 25 percent of public revenue and up to 5 percent of Mauritania’s GDP. However, in the northern city of Nouadhibou, women face a lack of access to capital and land, thus being driven to work in the fishing industry out of economic necessity. Despite their contributions to the economy, women in Mauritania work in poor conditions. They often have no choice other than to sell their goods outside of the fisheries market, isolated from the saturated Nouadhibou market. As a result of selling their products in smaller markets, women are forced to sell their products at lower prices and will attract only a few buyers. To avoid a drop in women working in the fishing industry, the Nouadhibou Eco-Seafood Cluster Project was created in March 2016 by the World Bank and the CIIP. The project will strengthen Nouadhibou’s port infrastructure while expanding its onshore fish processing activities, in order to develop a seafood cluster within the region. Targeted training will also be part of the project, reinforcing women’s skills in fishing and helping them grow their businesses and to generate value. The innovative Personal Initiative (PI) Training is one such project, with the goal of building entrepreneurial success within the community by introducing women entrepreneurs to new products and services. All these initiatives offer hope for women’s empowerment in Mauritania as they help women develop the entrepreneurship skills they need to become financially and economically stable. In addition to supporting women’s empowerment in Mauritania, these projects have also significantly addressed two urgent development challenges, poverty and unemployment. Terrorism, corruption, slavery and poverty. These are some of the significant issues that plague most of the African continent. Some of the lowest education and literacy rates can be found in Africa. One of the primary ways a country can help its citizens and begin to climb out of poverty is by providing education. Despite enormous political and economic challenges, one nation is doing this: Mauritania. Mauritania is a country of about 3.7 million people in the northwest corner of the continent, sharing borders with places such as Mali and Algeria. Given its geographical location and proximity to unstable countries, Mauritania faces egregious challenges both outside its borders and within them. This has undoubtedly made the pursuit of education expansion and overall poverty alleviation measures difficult to implement effectively. The overall literacy rate in the country suffered a decline between 2000 and 2015. This is clearly a result of failed policies by the government to provide education for its people. When compared to its neighbors, Mauritania spends the least amount of GDP per pupil. The fact that its neighbors suffer from similar if not worse conditions than Mauritania makes this even more absurd. However, in 2014, the Global Partnership for Education (GPE), a nonprofit fund dedicated to improving education systems in developing countries, began funding a new program in Mauritania. This new program is designated the Mauritania Basic Education Sector Support Project. There has been a myriad of successes since implementation, most notably the 101 teachers certified under the Teacher Training Initiative curricula and the construction of 10 middle schools in rural areas. This project is continuing to provide training for administrative support staff as well as distributing pedagogical kits to students and schools. In 2017, The Underrepresented Nations and Peoples Organization teamed up with the Association of Volunteers Against Illiteracy to improve education in Mauritania. This partnership sought to target specifically the Haratin minority by constructing two schools in the city of Nouakchott. The project was a success, having provided education to over 70 women and children in just under four months. In addition to the school buildings themselves, the Education Spells Freedom project provided a bathroom facility, rugs and school supplies in order to improve the experience of attendees. The challenges facing Mauritania will not be overcome quickly or easily. Education in Mauritania is a key starting point in the process of improving the lives of Mauritanians. The Education Spells Freedom project and the GPE program in the country should serve as a guide for future nonprofit organization initiatives regarding education in Mauritania and beyond. As a vast but very sparsely populated nation of less than 4 million, Mauritania is a country that rarely finds itself in the media spotlight. However, the nation has all of the classic signs of a developing nation: over half the population lives in or around the country’s capital of Nouakchott, over two-thirds of Mauritanians are younger than 15 years of age, less than half of the nation has access to improved sanitation facilities and only about half of the population can read and write. The nation’s dire situation raises the question of how to help people in Mauritania. The first and perhaps most urgent situation when understanding how to help people in Mauritania is that of Mauritania’s food security crisis. According to the World Food Programme (WFP), Mauritania depends on cereal imports to cover over 70 percent of its needs for the country’s 3.8 million people, and nearly 10 percent of the nation’s children under the age of five suffer from acute malnutrition. With 80 percent of the country’s landscape a desert, and less than 4 percent of it arable, this is a difficult issue to solve. As for the economy, Mauritania’s main exports include fish, as well as raw minerals such as iron, copper and gold ore. While these resources are in constant demand across the world, their prices are very rarely, if ever, constant. Fluctuations in the global market leave the nation’s economy completely unprotected from unpredictable and uncontrollable economic factors that directly impact Mauritania itself. The final factor in studying how to help people in Mauritania is that of a very difficult to solve socioeconomic issue found in many other developing nations, though rarely on the same scale: slavery. In fact, Mauritania did not fully abolish slavery until as late as 2007. In Mauritania today, over 1 percent of the population lives in modern slavery. While at first glance that figure may seem rather low, that equates to roughly 40,000 people experiencing life in slavery, a proportion that has granted Mauritania the alarmingly high rank of 7th out of 167 countries in slavery prevalence. Therefore, the best answer to the question of how to help people in Mauritania can be split into two categories: short-term and long-term solutions. In the short term, donations to NGOs should focus on the most pressing issues Mauritania faces, such as food and water security. Perhaps the most well-established and wide-reaching NGO in this area is the World Food Programme, which operates in 80 countries. Specifically, in Mauritania, the WFP focuses on food security, nutrition and school meal provisions, as well as adaptation to climate change. In the long term, countries and large corporations must do more to provide foreign direct investment into practices more sustainable than mineral and oil extraction. In particular, foreign finance agencies would be wise to invest in providing solar panels across the country, as well as train locals in their setup, maintenance, and repair in order to provide valuable skills and a reliable income to local tradesmen. In fact, a 15-megawatt solar panel facility has been established in Nouakchott, providing over 10,000 homes with a clean source of electricity. Establishing similar plants across the country will ensure access to electricity without damaging the local environment. With NGOs stabilizing the present, and foreign direct investment establishing a bright future, the question of how to help people in Mauritania largely comes down to two key aspects: solving the most immediate problems while setting up an environment to avoid such issues in the future. Mauritania may face dire problems today, but is in an excellent position to implement a brighter tomorrow.